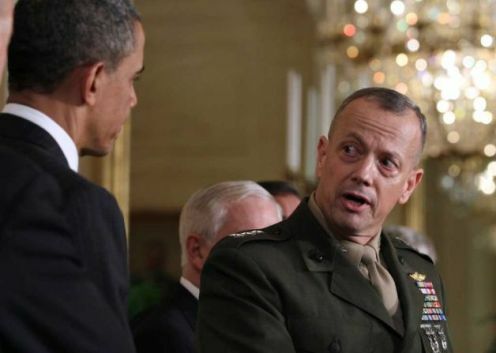 Is Gen. John Allen already at odds with the president on Afghanistan? You are at:Home»Afghanistan»Is Gen. John Allen already at odds with the president on Afghanistan? Gen. John Allen, right, is recommending that new troop reductions be pushed off until after 2014. With a massive military drawdown in Afghanistan looming, there are plenty of questions about what U.S. forces and NATO can do to consolidate and preserve gains in security that have been made in the war-torn country. Military leadership appears to have accepted that forces will be cut from the estimated 97,000 troops in theater to about 68,000 by the end of next summer. That would leave the U.S. with about the same amount of troops that it had in combat before President Obama ordered the surge of about 33,000 troops into theater in late 2009. A new report in the Wall Street Journal suggests that Gen. John Allen, the top commander in Afghanistan, is privately lobbying to end the drawdown there, at least for now. That would appear to put him at odds with Obama, who has said troops would continue to leave at a “steady pace” after 2012. … people briefed on Gen. Allen’s thinking said he wants to halt troop withdrawals after the 2012 reductions and maintain troop levels at 68,000 through all of 2013. He envisages the drawdown resuming sometime in 2014, the year Afghans are scheduled to assume lead responsibility for securing the country, officials said. This position reflects the findings of an internal assessment by NATO’s International Security Assistance Force, which Gen. Allen commands. The assessment, officials said, warns that quickly cutting U.S. troop levels below 68,000 would make it harder to clear and hold insurgent havens, and would complicate efforts to protect supply lines and bases ahead of the scheduled 2014 handover. And therein lies the next likely rub about managing the war. While it is now accepted that the U.S. and coalition forces likely will not crush all vestiges of the insurgency before they leave Afghanistan, there are still many parts of the country that resemble the Wild West, especially in the east. One needs only to watch this video to see that there’s also still plenty of fight left in Helmand province, where about 19,000 Marines are still deployed. It was acknowledged in many circles that the surge to 100,000-plus troops was temporary in nature, but the timeline for cutting forces below the amount in country in 2009 was never clear. Those decisions will go a long way toward deciding how quickly it takes to complete the drawdown, and what we leave behind in Afghanistan. With ALL the military experience obama has, he couldn’t lead the Cub Scouts down a straight road !!!! Just my opinion…. This is no shock, really. The General is simply following his fifth general order- to quit my post only when properly relieved. Seeing as how our esteemed Commander in Chief has never had cause to learn the general orders, he can’t possibly be expected to understand this concept. Semper Fidelis. just a small question. if not now then when? what happens in 2014 when its suggested that we stay until 2020? sometimes it just time to say enough. its beyond time to say enough with Afghanistan. Granted, Paul. However, putting troops at risk without adequate numbers to reinforce and supply just to follow some pulled-out-of-the-hat date (or pulled from somehwere else, for that matter) isn’t wise. Perhaps the POTUS should listen to his military advisors who know a tad bit more about warfare than he does and let them prepare a reasonable exit strategy. This POTUS is an obtuse buffoon, who couldn’t extract a french fry from a happy meal. So what should we expect. I would be worried IF General Allen was not at odds with President Obama. Hawks and Doves…my friend…hawks and doves. Hang tuff General Allen! General John Allen is a man of integrity. If the General states that we need to halt withdrawing our troops President Obama needs to listen. I’ve worked with the General and I very much know his character. I fully agree, General John Allen is an admirable and honourable man, from what I read.